I have asked for and received sponsorship to shear off my hair (with clippers!) before we leave for our cycling camino on 19 Sept. I thought that raising money for WaterAid was appropriate as the availability of drinking water, toilets and showers becomes more significant for pilgrims on the road! At least I won't need shampoo if my head is shaved! My children think I'm mad, but I am looking forward to the wind on my scalp as we speed down hills! PS Photos will be posted on our blog, justgiving and Facebook! Every year there is a 'shave-a-thon' at all our shopping malls in aid of cancer. I haven't had the courage to be scalped but I have had a no. 1 asnd gone pink! Pink - now there's a thought??? I once allowed 2 work colleagues to shave my hair into a mohican and colour it blue...the dye washed out straight away but I had to keep the mohican 1 week and then they shaved it all level for me. Good point! Some colleagues in another team are already trying to raise the donations because I have said that as the money increases the clippers will get closer to the scalp! I was already thinking that such enthusiasm deserved being in on the action! Daughter no 3 has asked daughter no 4 to search out pink hair dye - if I do this before the cut that might attract more interest. I work in Children's services - I may have to tie a scarf around it all if something terribly serious requires my presence between now and departure - but no longer do the sort of work which takes me into court, thanks goodness! And it is already arousing some interest in the issues of clean water and sanitation, so I'm not feeling so unwise any more! All I can say is GO GIRL!!!! You won't regret it. I think the colleague who wielded the clippers was more nervous than me! I did buy some scarves but in the end just brazened it out in meetings. Luckily all were with people I knew fairly well so I simply announced at the start that I wasn't sick (you will get some looks of alarm with a freshly-scalped bonce), just raising money, and pointed them at the appropriate webpage for more details/pictures etc. PS If you have it all shaved right down you can't easily dye it - that is why the evil colleagues wanted a mohican - they got to shave my hair AND dye it a stupid colour. 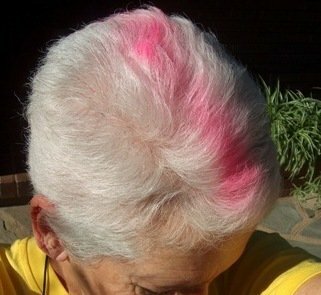 The Cancer Association used Pink Hair Spray from an aerosol can. It did wash out but left a residue of faint pink so that I looked like one of the seniors who dye tint their hair blue or pink! No ... you reeeeely don't! Not a pretty sight! Last year I just had a pink stripe for breast cancer. Next year I'll go pink again!